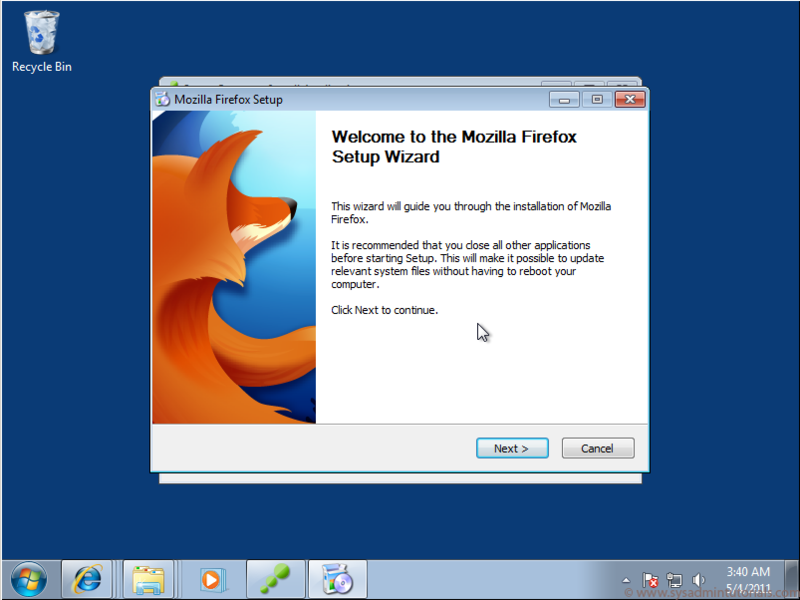 This tutorial will guide you through how to install Vmware Thinapp Packager, in which after we will package Firefox 4 into a Thinapp Package. This tutorial is performed on a baseline or SOE desktop image of Windows 7. Firstly create a base line snapshot so that you can revert to this snapshot at the end of this tutorial. 1. 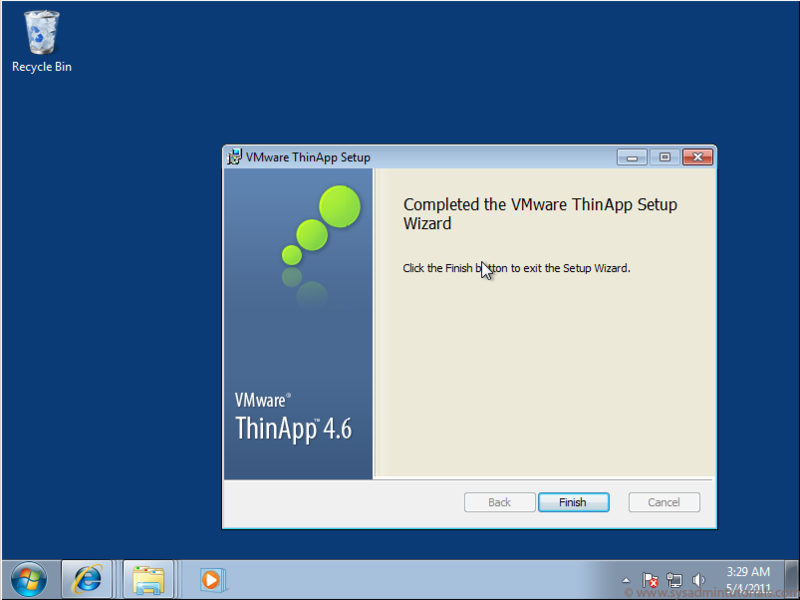 Double click on the Vmware Thinapp Enterprise file to start the installation. 5. 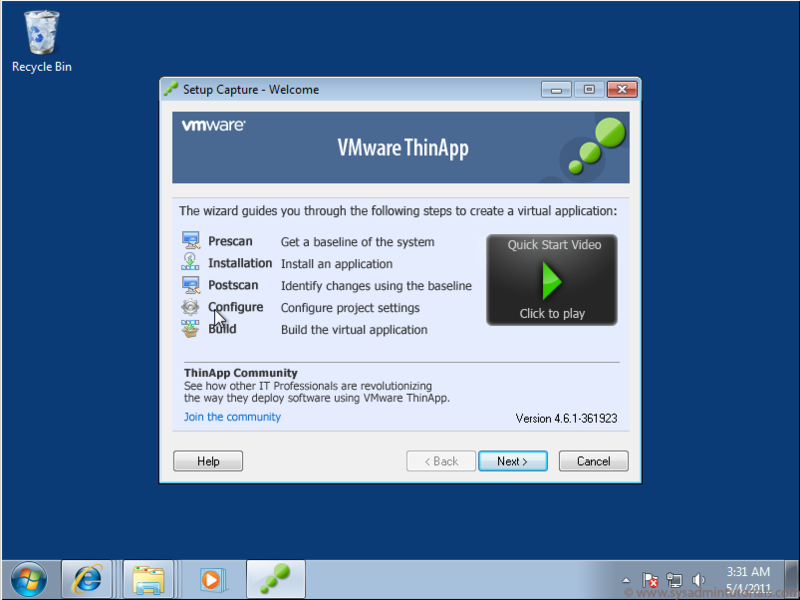 Enter your license key for Vmware Thinapp Packager and enter in a License Display Name. 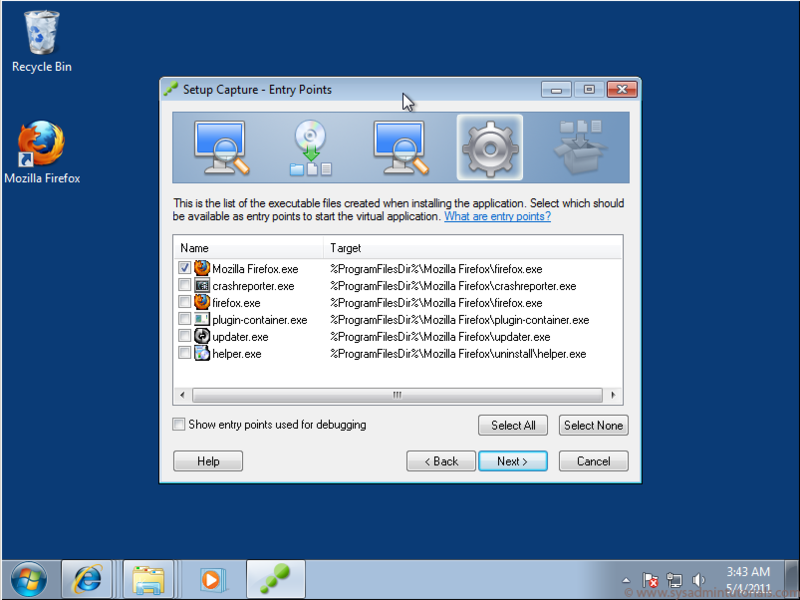 The Display Name will be displayed each time a Thinapp Applications is launched. Click Install. 6. The install is complete, click Finish. 7. Now we’ll start the Thinapp Setup Capture and begin with the actual application capture.Click on ThinApp Setup Capture to start the application. 10. When we click on Prescan, the application will scan the Operating System and create a baseline so that it can see what changes are made once an application is installed. Click Prescan. 11. After the Prescan is finished we are notified to install the application that we wish to capture. 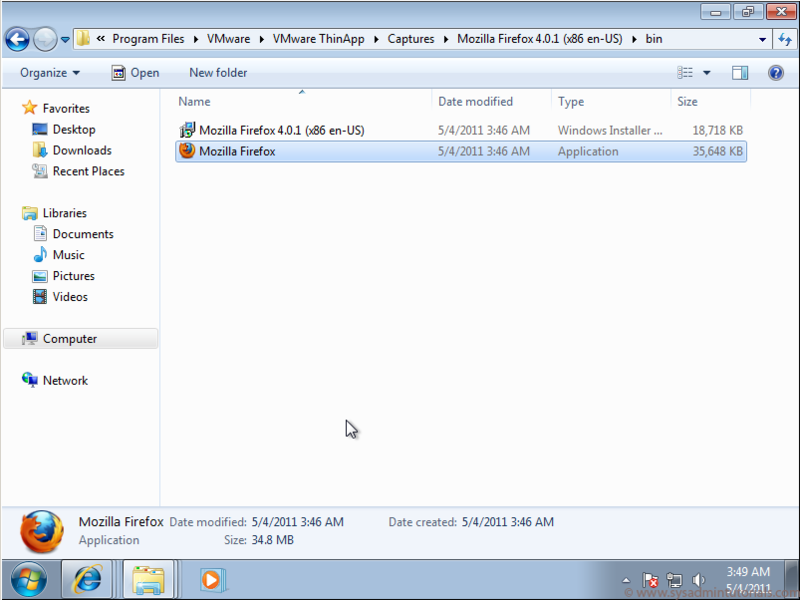 In this example it will be Firefox 4. I’ve already downloaded the install files for Firefox. 12. Go ahead and install Firefox and make any changes that you wish to carry into the Thinapp. For example I would change the default cache size down to 150MB. 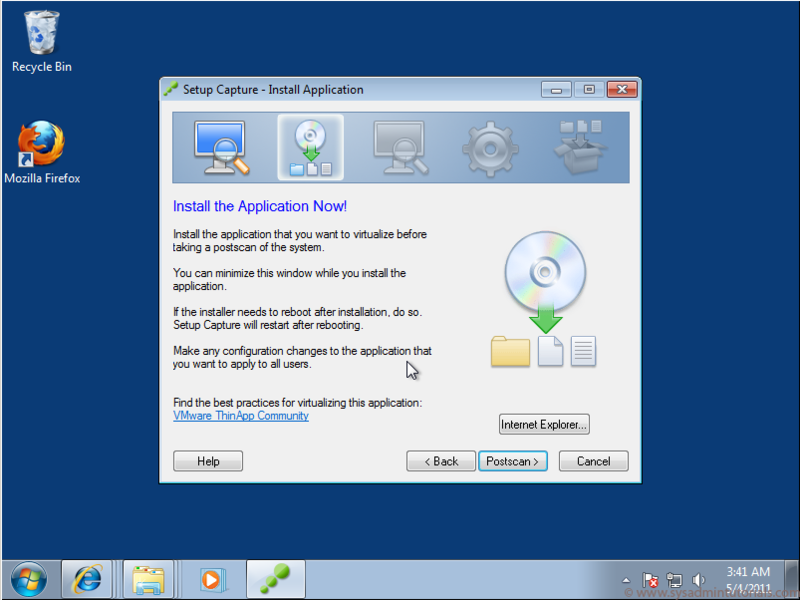 If you are installing another application that requires a reboot, go ahead and reboot the system and Thinapp Capture will start up automatically once you’re logged back in. 13. 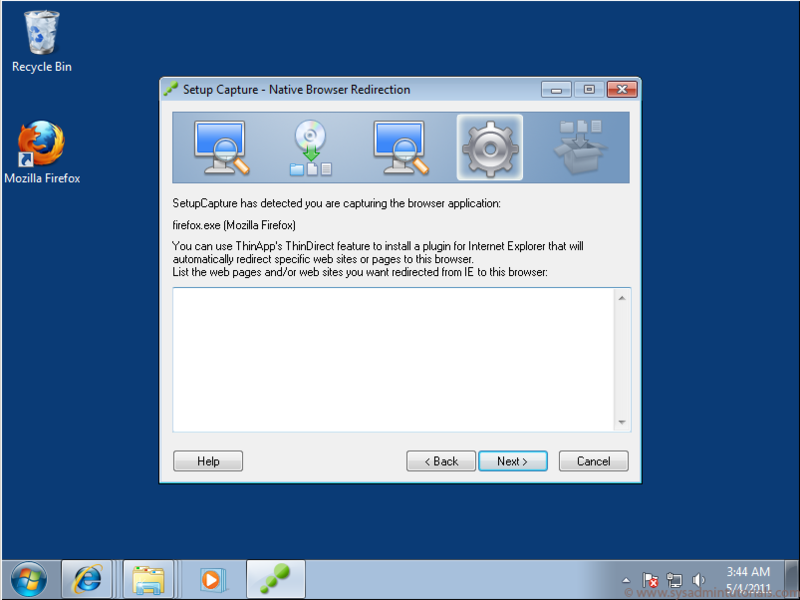 Back at the Thinapp Capture click Postscan. The Postscan will scan your computer and pick up on changes that have been made to the system since the Prescan. For example files and registry. 14. You will be asked if the application is completely installed. Click Ok.
15. The Entry Point is basically the list of applications that have been detected by the Postscan. Click the application that you wish to package and click Next. 16. You have the ability to limit the application to Everyone or by Active Directory and Local groups. In this tutorial I will select Everyone. Click Next. 17. The description in the following image gives a good explanation as to what each setting does. For more information check the Thinapp Admin guide in the Resources section. Click Next. 18. I would like to keep user configuration and data in the %AppData%Thinstall directory. Click Next. 19. Choose whether you wish to send anonymous usage statistics to Vmware. Click Next. 20. Thinapp has detected that we are packaging a browser application and you have the option to redirect user specified web sites from internet explorer to firefox. If you wish to include any redirected websites, type them here and click Next. 21. Give a name to the Inventory. 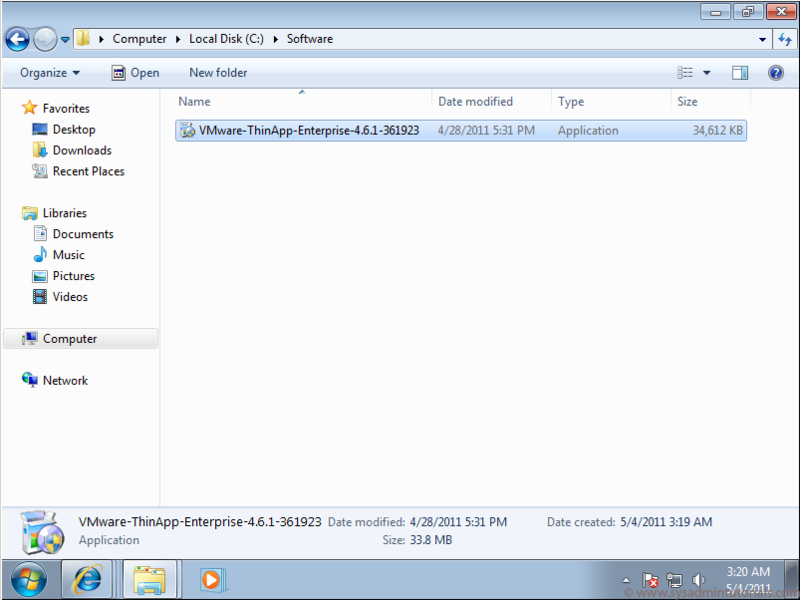 This is the folder that is created in C:Program FilesVMwareVMware ThinAppCaptures. Click Next. 22. 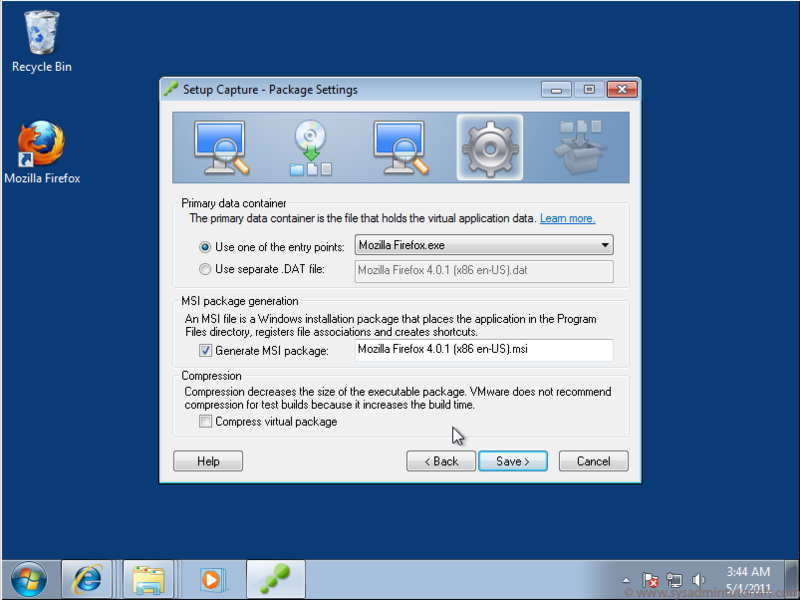 You have an option to create an MSI package and Compress the virtual package. Click Save. 23. You can edit the Package.ini for further customization. Click Build. 24. The build process is now complete. Click finish. 25. If we go to the location where we saved the capture we will see the MSI and the Virtual Thinapp Application. Copy this folder to a network share somewhere and revert the Operating System snapshot back to the baseline. Repeat this tutorial to create another Thinapp Application. The concept of vSphere standard switches is fairly straightforward. With vSS you have one or more virtual switches on each host, each with their own uplinks to the network. Each switch has one or more port groups (like vKernel and Virtual Machine) with VMs being connected to the virtual machine port group. What about vSphere Distributed switches? Do you need them? I must admit that when I first heard about vSphere Distributed switches, while I thought that the idea was innovative and cool, however I figured I really didn’t need to use something like that as I thought that it was likely “overkill” for my lab (and most companies). Because of that, I initially didn’t devote much time working with vDS (or dvswitch, as it’s sometimes called). However, the more I have used vDS, the more I have come to realize how powerful and necessary it is (and by the end of this article, I hope that you have too). vDS is only available to those who have vSphere Enterprise plus and it’s not enabled by default – you need to make the choice and fulfill the creation of the vSphere distributed switch, add uplinks from hosts, and add virtual machines to port groups. The vSphere Distributed Switch maintains network runtime state for VMs as they move across multiple hosts, enabling inline monitoring and centralized firewall services. It provides a framework for monitoring and maintaining the security of virtual machines as they move from physical server to physical server and enables the use of third party virtual switches such as the Cisco Nexus 1000V to extend familiar physical network features and controls to virtual networks. What’s New with vSphere Distributed Switch Version 5? None of these features would be possible without the vSphere distributed switch. 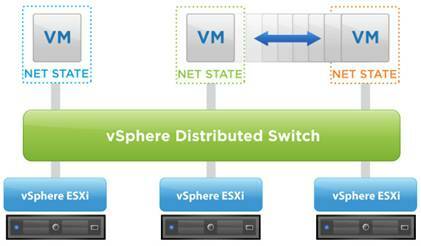 vSphere distributed switch isn’t a whole new product that you install. If you have vSphere enterprise plus, vDS will just be a feature that you take advantage of. When you worked with traditional vSwitches, all configuration was done on each of the hosts. The benefit to vDS is that it is a centralized administration and configuration. Thus, all vDS administration is done in the vSphere Client’s networking inventory. 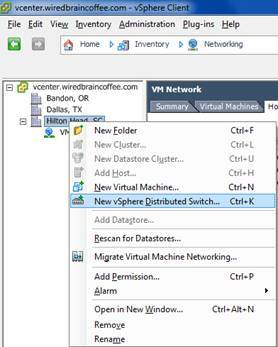 Notice how, by default, you have a single standard vSwitch called “VM Network” in your virtual datacenter. This is being used by your virtual machines to connect to the LAN and by your hosts for vmkernel traffic like vMotion, iSCSI, NFS and even the vSphere Client / vCenter traffic. To create our first vDS, we are going to right-click on the virtual datacenter and click New vSphere Distributed Switch(or ctrl-k). This will bring up the Create a vSphere Distributed Switch wizard that will guide us through the process. We first need to select what version of vSphere distributed switch that we want to create. Unless you have older ESX 4 or 4.1 hosts then you want to create the latest switch version – 5.0.0 – because you’ll get all the latest features that are available. Click Next and then we need to give the vDS a name and select the number of uplink ports. The default name for a new vDS is dvswitch. While the default name certainly works for your first dvswitch, best practices tell us that we should give the dvswitch a much more useful name like “Production-1”, to tell use the purpose or importance of the traffic running on this new dvswitch. Click Next. 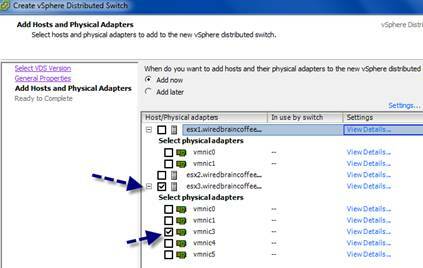 Now you need to specify, first, if you want to add ESXi hosts and their adaptors to the switch now or later. By choosing “later”, you are creating, basically, an empty dvswitch that has no outside network connectivity. That means that if you put virtual machines on it, they would only be able to communicate with themselves (not the outside world), until you added uplinks. Also note from the graphic that you may have the same problem that I do in that you may have an ESXi host that you want to be a part of the dvswitch but that host has no uplinks to add. Solving this problem may be as simple as going to the standard vSwitch on that host and removing some redundant uplink adaptors. However, let’s say that you have an older host that just has a single Ethernet adaptor. In that case, you really need to add some additional NICs (they aren’t very expensive and if you are willing to buy licenses for vSphere Enterprise plus then having redundant NICs on your host should also be part of your complete virtual infrastructure design). To start with, I selected to add a single adaptor from one of my two hosts that had adaptors available. You can always add more adaptors later. 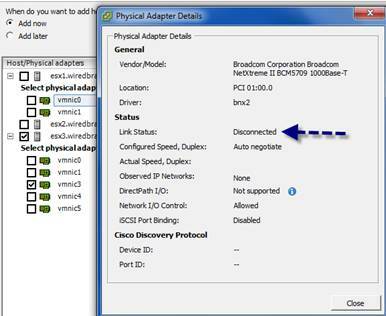 Quick tip: you can click on View Details for each of the adaptors that are available to add as these adaptors may be disconnected or be the wrong network speed. In my case, none of the adaptors from host ESX1 were connected to the network (even though they were available to be added). Click Next and you’ll be prompted to finalize your addition of the dvswitch and create the first default port group (we’ll talk more about dvportgroups in our next post). Take the default here and click Finish. At this point, you should see the new dvswitch being created and now in the inventory, you’ll find your new dvswitch, your uplink port group and your dv port group. Congratulations, the creation of the dvswitch is done! However, no virtual machines are on the switch yet so we really can’t use it. Read my next article on this topic – Using vSphere Distributed Virtual Switches. There will be quite a few things to consider when you need to decide weather to use Distributed vNetwork switch. If you have converged adapters and 10GbE adapters there may not be enough physical NIC’s to use the vSwitch effectively. 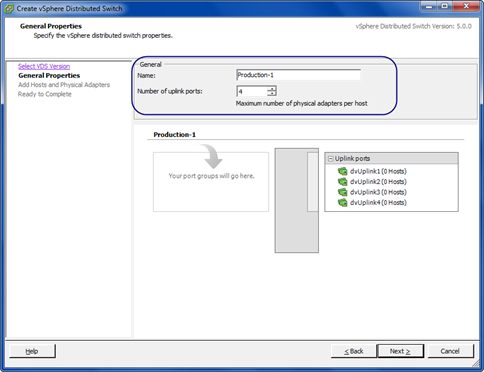 In order to use Distributed switch Enterprise Plus license is required as well as vCenter Server. The main benefit of dvSwitch is its ability to span multiple ESXi hosts. In some cases mixed environment of dvSwitch and vSwitches is the best solution. 1. Bidirectional Virtual Machine Rate Limiting or Traffic Shaping – dvSwitch adds capability to shape inbound and outbound traffic whete vSwitch only able to work with outbound traffic. 2. Private VLAN Support – dvSwitch provide PVLAN support. 3. Port Mirror – Port mirroring is used for monitoring. With port mirroring copy of packets from port or vlan send to monitoring device connected to switch prt. 7. IEEE 802.1p Tagging – QoS standard at MAC ( media access control ) level. 9. Dynamic Adjustment for Load-Based NIC Teaming – Improves performance of how NIC teaming feature. 10. Centralized vCenter Administration and Provisioning – Provides easy administration and single configuration to manage. 11. Network Health Check – feature used to quickly identify configuration errors on the network. 12. LACP support – LACP is standard link aggregation protocol which is supported with dvSwitch. 13. Traffic Filtering and Marking – Feature used for priority tagging. Fail over and Load Balancing Policy – Determines how to deal with failed adapters and how traffic will be distributed. VLAN Policy – Establishes vlan ID for network connections. 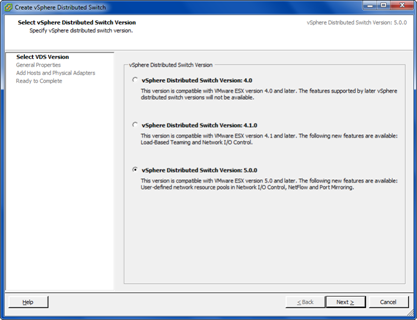 Note that distributed switch version follows the same version as vSphere. All of them add support for different features and features supported by later versions are not available in prior versions. In this LAB we will create dvSwitch named DSwitchLAB in datacenter called LAB-Datacenter. 1. Connect to a vCenter Server with vSphere Web Client. 2. On Home page go to vCenter -> Distributed Switches. 3. On the Objects tab click on Create New Distributed Switch. The name of our new distributed switch will be DswitchLAB and our datacenter is LAB-Datacenter. 4. Select Distributed Switch 5.5.0 , select Next. 5. Lets select all defaults on next screen. Uplink ports will connect our Distributed swicth to physical NIC’s and indicates max. Number of of NIC’S per host that can can connect to swicth. When network I/O control is enabled, distributed switch traffic is divided into the following predefined network resource pools: Fault Tolerance traffic, iSCSI traffic, vMotion traffic, management traffic, vSphere Replication (VR) traffic, NFS traffic, and virtual machine traffic. You can also create custom network resource pools for virtual machine traffic. You can control the bandwidth each network resource pool is given by setting the physical adapter shares and host limit for each network resource pool. 6. Review information and click Finish to add the switch. 7. Select the dvSwitch you just created and right click it. Under Edit Settings review General and Advanced features. The switch is now created but we are not done yet. Next step will be adding ESXi Hosts to our newly created switch. 1. Connect to a vCenter Server with vSphere Web Clinet. 2. On the Home page, click vCenter -> Distributed Switches in the left pane. 5. Ones selected click ok to continue. Verify our hosts listed and status shows as Connected. Click next to continue. 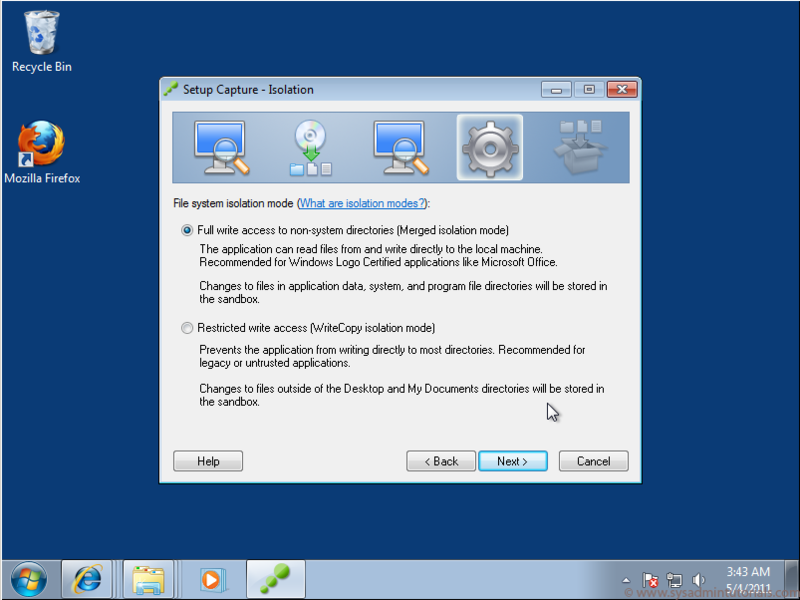 6. Review information on Select Network Adapter Tasks screen and click Next to continue. 7. In our example we have 2 ESXi hosts and each with 2 adapters. Vmnic0 assigned to vSwitch0, the remaining vmnic1 we will assign to dvSwitch. 8. Select vmnic1 on the first ESXi host and then click on Assighn Uplink, click Uplink 1 and then select ok. Do the same on the second hosts. Your manage physical network adapters screen should look like on the image. 10. Review Analyze impact screen. Click Next. 11. Review Ready to Complete. Click Next. 12. When task completes our dvSwitch will be created. At this point go to vCenter->Hosts and Clusters. Select one of the hosts , select Manage tab. Click on Networking tab to review configuration. It should look simular to image. 2. On the Home tab, click Networking. 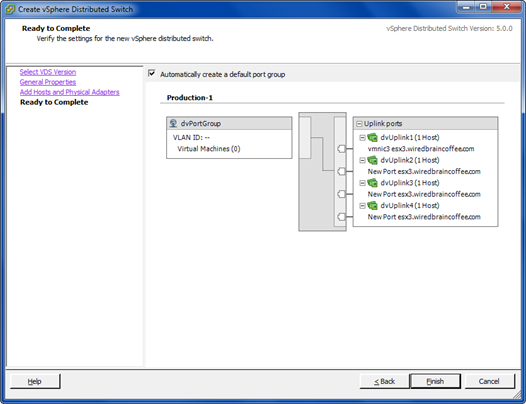 Select DSwitchLAB right click on it and select New Distributed Port Group. 3. For the name we enter LAO-Servers-PortGroup-vlan10 click next. 4. In our case we chose vlan 10 for our server network. Click Next after you review your settigns. 5 Under vCenter networking your should see your Port Group created. Now our dvSwitch created and configured. There will be number of configuration options we will leave out for now. We will use Static binding as it is default and is recommended by VMWare for general use. With static binding, a dvPort is immediately assigned and reserved when the virtual machine is connected to dvPort. Managing the license on VMware ESxi and VCenter is one of main job for system administrator.After the installation of the product, you may need to add the new license to increase the capacity and you may need to remove the old license keys from the those products. Sometimes you may need to pull out the existing license keys for inventory purpose. Here we will see how we can manage the ESXi and VCenter server licence using VSphere Client . 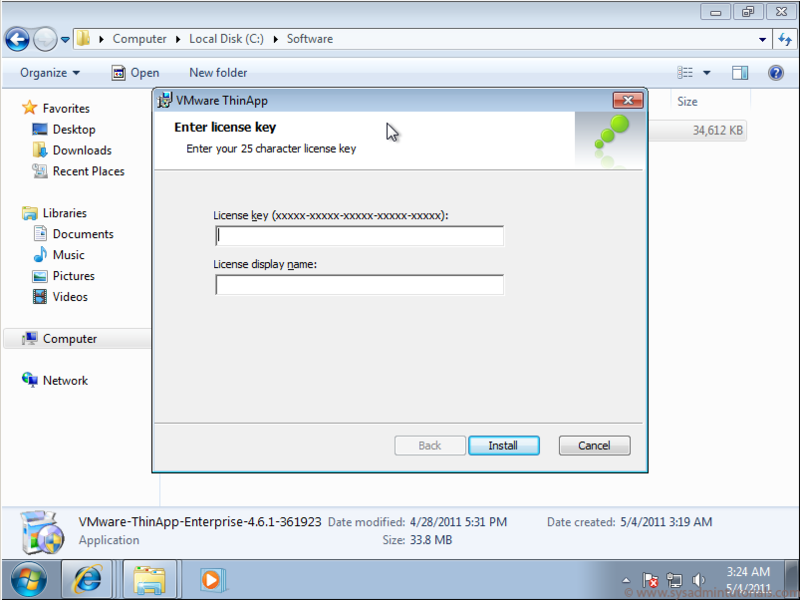 How we can get the installed license keys of VMware ESXI servers and VCenter Server ? 1. Login to VSphere Client and navigate it home. 2.Navigate to Administration and Licensing .Here you can see the existing license of Vmware ESXI nodes and VCenter Server. 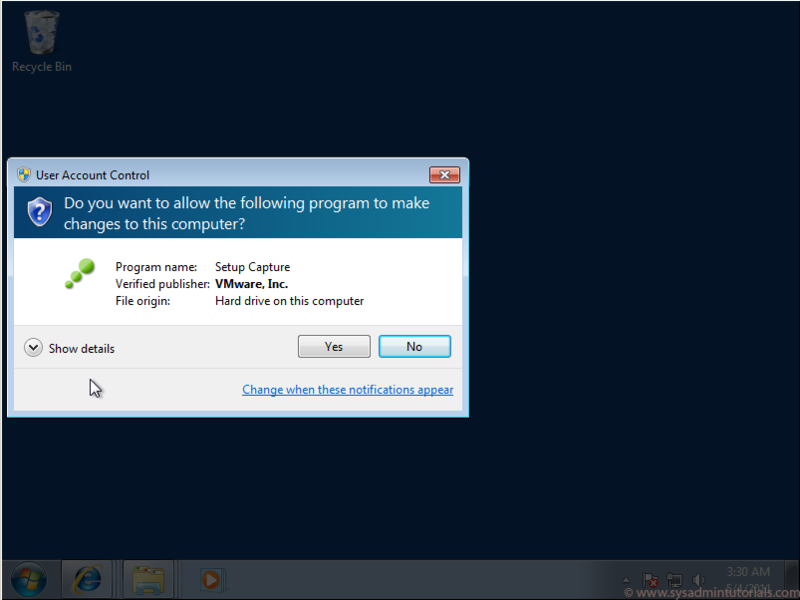 3.In order to install or remove the existing License keys , you need to click on “Manage VSphere Licenses” (Step:2). This will popup the below window to manage the VSphere License keys.If you want to add any new license keys , you can just copy & paste one by one. 4.The next step will be assigning the specific license keys to the products.In some cases, license may be purchased to run some limited VM’s and that needs to assigned to specific host.In this case ,you need to assign the license keys manually.For ESXi , you need to click on the first tab. The below window shows vCenter Server licenses(Second tab).If you want to remove any existing license keys ,you can remove it using the next step. Once you have done,you click on the confirm changes. 5.You can also extract the reports from the reporting tab. (Refer Image Step:2). Once you click on the reporting tab , you will get window like the below one.You can just click export to get the details in Excel sheet.It provides complete usage details of the installed license details. when we are talking about VSphere licensing , i just want to let you know about the free license of ESXi and vCenter Server. VMware offers 60 evaluation period for vCenter Server and ESXi .So you need to search for free license keys of Vmware ESXi and vCenter server . You can install and test these products with complete features for 60 days. After 60 days ,you may need to install the license keys to keep working on these products. vCenter will not allow to administrate the ESXi nodes after 60 days without valid license keys. The below tables provides the licensing requirements of newer version of VMware ESXi and vCenter Server. Existing product version Version to be upgraded to Is a new key required? 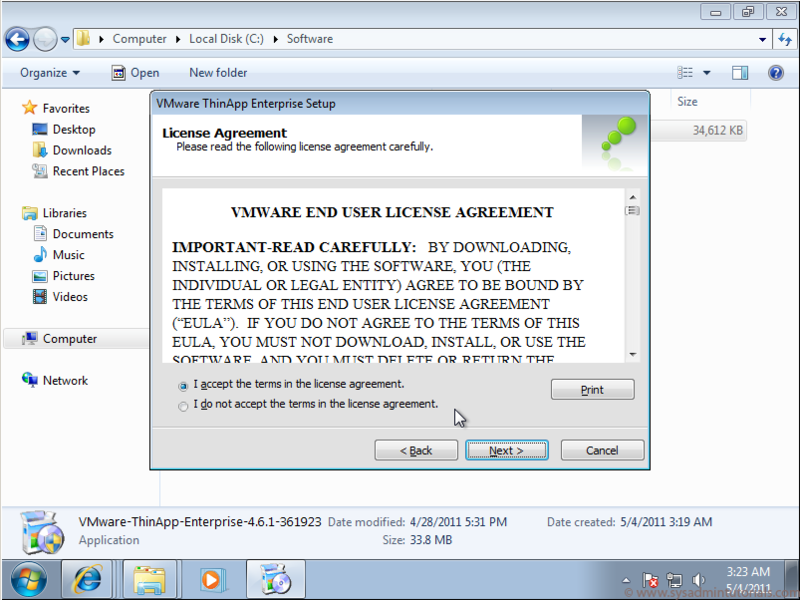 The SnS Contract for the product is active, can the license key be upgraded in My VMware Portal? You can also download Free VMwareESXi 5.5 that VMware offers without any memory limitation. For more details,Check it here. 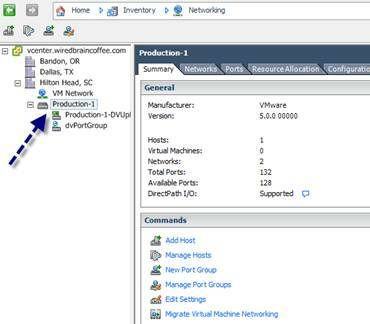 Configuring the DRS (Distributed Resource Scheduler) cluster is simple task in VMware if you have already worked on legacy clusters like veritas cluster.In a order to obtain the cluster-level resource management ,you need to create the DRS cluster. DRS cluster is nothing but a bunch of ESX/ESXi Psychical servers.Once you have added the ESXi or ESX nodes to the cluster, those node’s resource will be part of cluster resources. Using the DRS cluster you can easily mange the load balancing across the ESXI/ESX servers and power management. You can also configure the affinity rules to control the virtual machines placements across the datacenter. Before moving further, you should know the difference between VMware HA and VMware DRS . VMware HA is only responsible to migrate the virtual machines to another host in the event of ESX/ESXi host failures. Where as DRS can failover the virtual machine to another ESXi host if the ESXi server load is too high. So the bottom line is ,DRS used for ESX/ESXi host load balanacing and VMware HA will be used for failure dettection and failovering the virtual machines. In most of the critial enviromnets, VMware DRS and HA will be used together. In the artcile, step 3 has option for VMware HA to enable it while creating the new DRS cluster. 1.Login to VMware vCenter server using web-client.Here i have already created the blank datacenter without ESXI hosts. 4.Now its time to add the host to the cluster. Click on the “Add host” link. 5.Enter the ESXi first node details . 7.Here is the node summary. 8.Assign the valid license keys to ESXi. 9.The next will be to provide the resource pool information. If you want to keep it in under root resource , you select the below option and continue. 10.Review the summary of the cluster and click finish to create new cluster. 11.Now you can see new cluster has been created and both the cluster nodes are showing just under the cluster name. That’s it . You have successfully created the DRS Cluster using two physical servers. The new virtual machine can be created on either of the cluster nodes. According to affinity rule, virtual machine will failover from one node to another. Once you have configured the ISCSI storage on VMware ESXi, you can start creating new datastore using those ISCSI LUNS. By default ,the wizard will try to create filesystem type as VMFS5 and this filesystem can be able to support up to 2TB LUNS. If you want that datastore to be accessed across VMware ESX/ESXi version 5.0 and lower , then you need to choose VMFS3 filesystem. You can also have an option to create NFS datastore which will be used to store ISO images and virtual machines snapshots. Here we will see how we can create a new ESXi datastore using the ISCSI LUNS. 2.Click on the datastore to create it . 3.Select the datastore type . 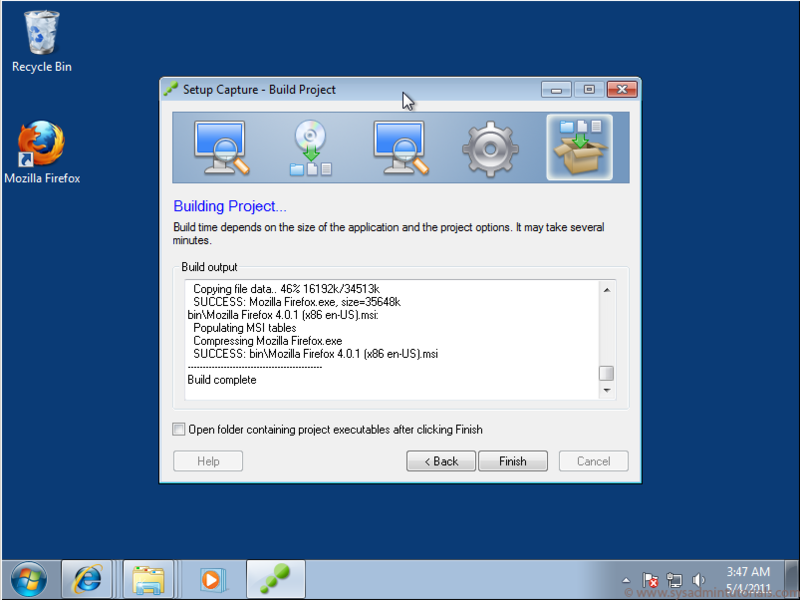 5.Select the VMFS version . 6.Click on all available partitions and allocating the complete disk space to UnixArenaDS1 datastore. 7.Here is the summary of the new Datastore. 8.Click to finish the wizard. The ISCSI-based datastore is created. It is available to the ESXI hosts to for VM provisioning. Thank you for visiting UnixArena. Most of the VMware virtual machines are configured with few virtual disks with different size according to the project requirement. When it comes to the Linux VM , there will be a dedicated disk for the root filesystem and other disks are used for application/data. So whenever there is request for resizing the existing drive , it is very easy to figure-out with fewer disks with help of variable size. But how do you map if any VM is running with 50+ virtual disks and fewer disks are directly mapped from the SAN using RDM(Raw Device Mapping) method. It’s quite complicated thing. In this article , we will find an easy solution to map the Virtual Machine disks to Linux disks or vise-versa. Here , I have added one more disk from SCSI controller 3. From the above screenshots and Linux disks lists , we are able to map only one disk with the help of size. What about other three disks ? How can we map it ? 1. Login to Linux VM and execute the dmesg command with “grep” function like below. 2. In the above screenshots , you might seen the SCSI id’s for each disks. Just compare the VMware SCSI ID’s with Linux guest SCSI id. Apart from the no of digits , both SCSI id’s are identical and this is the easiest way of mapping the disks. But in some cases(RDM disk are assigned to VM) , the above mapping is not sufficient to map the VMware guest disks. You might require another validation prior to confirming the disk mapping. 2. The “sgX” numbers will be always stays in the “N-1” to the VMware disk numbers. So just do N+1 for sgX to match the VMware Disk numbers. Let me bring up the table for you. 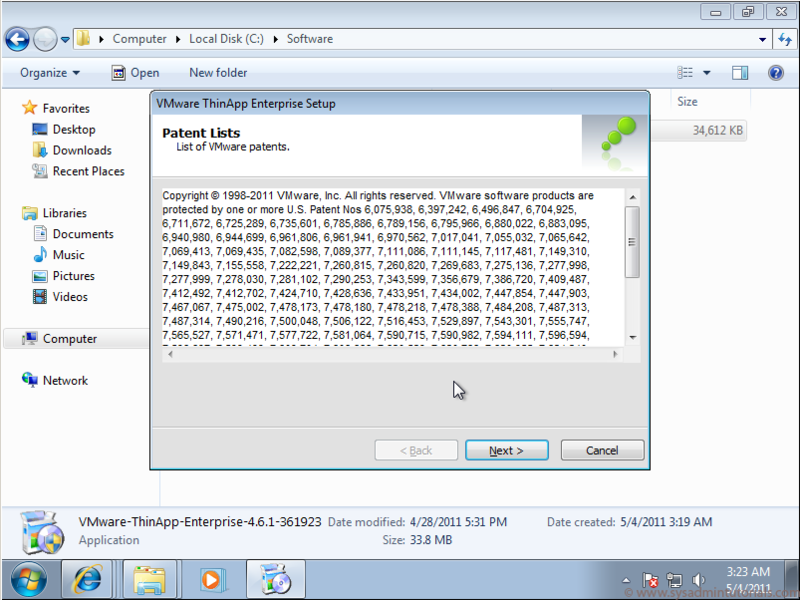 We have successfully mapped the VMware guest’s virtual disks to Linux OS disks. Its always recommended to perform multiple checks to confirm the disk mapping. The above testing have been performed on VMware vSphere 6.x and Redhat Linux 7.x . Hope this article is informative to you . VMware infrastructure become very large day by day and VMware is keep on integrating new technologies to their newer vSphere releases. Its becoming quite difficult for VMware newbies to understand the technology and product completely. This article will answer many questions for VMware beginners about the VMware vSphere product offerings and features.I have not explained the products and features very deeply but this one line answers will help you on interviews to keep your answer short and sweet. 1.What are the products included in VMware vSphere 5.5 Bundle ? 2.What type of Hyper-visor VMware ESXi is ? VMware ESXi is Bare-metal hypervisor. You can directly install on server hardware. 3.What is the role of VMware vCenter server? vCenter provides a centralized management platform and framework for all ESXi hosts and their respective VMs. vCenter server allows IT administrators to deploy, manage, monitor, automate, and secure a virtual infrastructure in a centralized fashion. To help provide scalability , vCenter Server leverages a back-end database (Microsoft SQL Server and Oracle are both supported, among others) that stores all the data about the hosts and VMs. 4. Is it possible install vCenter server on Linux hosts ? No.But Pre-build vCenter appliance is available in VMware portal which is Linux based.You can import the appliance as virtual machine. 5.How to update the VMware ESXi hosts with latest patches ? 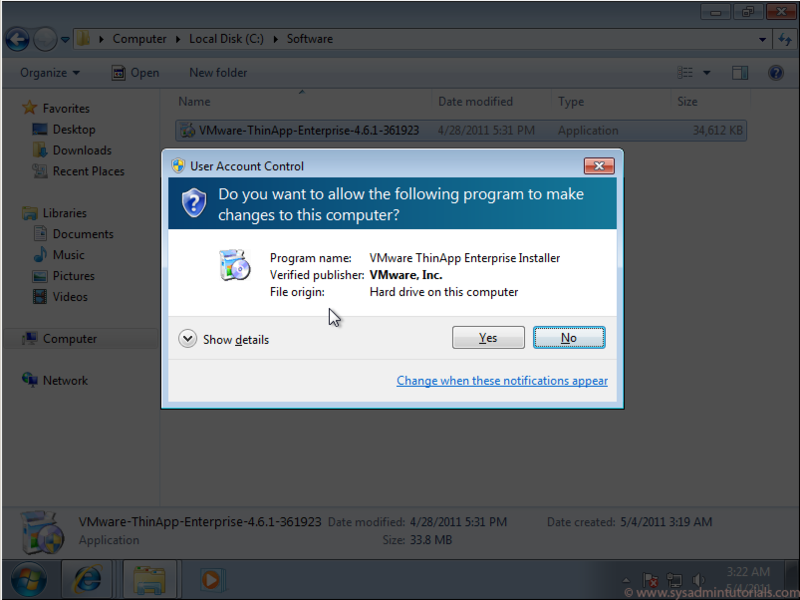 6.What is the use of VMware vSphere Client and vSphere Web Client ? vCenter Server provides a centralized management framework to VMware ESXi hosts.To access vCenter server, you need vSphere client or vSphere Web client service enabled. 7.What is the difference between vSphere Client and vSphere web client ? 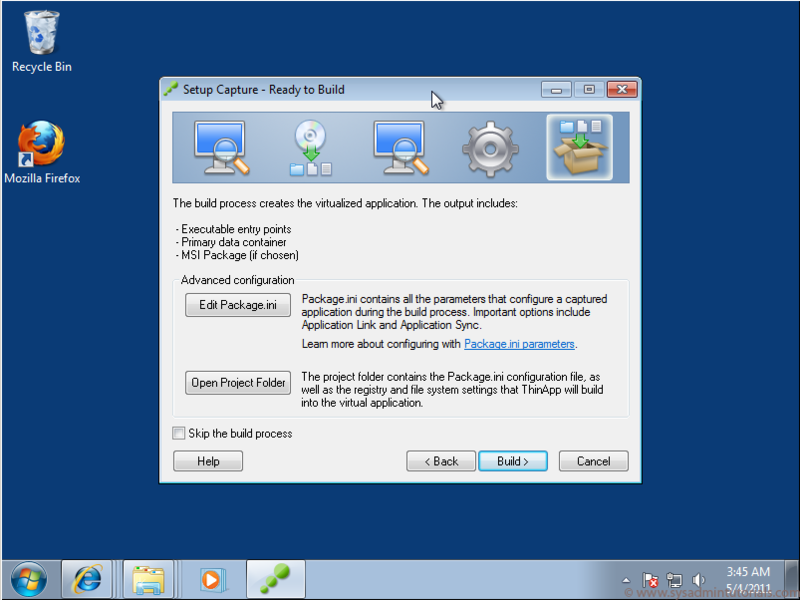 vSphere Client is traditional utility which provides user interface to vCenter server. But from VMware vSphere 5 onwards,vSphere web client is a primary interface to manage vCenter server.For vSphere client, you need install small utility .But vSphere Web client doen’t require any software. You can directly connect using web browser.But still VUM is managed through vSphere Client . 8.What is the use of VMware vCenter Orchestrator ? vCneter Orchestrator is used for automation on various vSphere products. 9.What are the features included in VMware vSphere 5.5 ? 10.What is the use of vSphere High Availability(HA)? Where it can be applied ? VMware vSphere HA minimize the VM’s unplanned downtime by restarting the VM guests on next available server ESXi node inacase of failure on current ESXI node. VMware HA must be enabled to reduce the VM unplanned downtime. Please click page 2 to continue. 11. Will vSphere HA help on VM failures too ? In an order to detect the VM failures, you need to enable VM Failure Monitoring. So that it detects the Disk I/O and sends the internal heartbeat to check the VM all the time. If the VM is stopped functioning, VM will be restarted automatically by vSphere HA. 12.What is the use of vMotion ? Using vMotion feature,we can move the running VM’s from one ESXi host to another ESXi host without any downtime. vMotion copies the VM’s in-memory contents to the destination server and freeze the operation on current ESXi host and resumes the VM’s on remote ESXI node. 13.What is the use of Storage vMotion ? vMotion is possible only when you have Shared storage like FC-SAN,ISCSI-SAN or NFS. If you want to move the VM from one datastore to another datastore without any downtime,then you need to perform storage vMotion. Note: You can perform the vMotion and Storage vMotion together without any downtime. 14.Why vMotion feature is not used/can’t use in vSphere HA ? vMotion is used for planned migrations and possible only where the source and destination ESXI hosts are running properly.vSPhere HA is used to reduce the downtime due to failures of physical ESXi hosts.So When the failure accours on ESXi nodes, there is no time to perform vMotion and can’t be used. 15.Is there any way to prevent the VM’s unplanned downtime using vSphere HA ? Yes.You can prevent the unplanned downtime using vSphere falut tollerance along with vSphere HA. 16.How the vSphere Fault tolerance(FT) works ? Using vLockstep technology , vSphere FT maintains the mirrored secondary VM on different ESXi physical host that is kept in lockstep with the primary.So when the primary ESXi node goes down due to hardware issue, secondary VM will immediately step-in and provide the service. At this point, this VM will become primary and secondary aka mirrored VM will be created on possible ESXI host to prevent the further ESXi failure. 17.What is vSphere DRS(Distributed Resource Scheduler) ? How it works ? vSphere DRS is an intelligent frame works which always monitors the cluster nodes health check and performs the vMotion automatically whenever required. For an example ,if one of the ESXI cluster host memory has been utilized more than 90% and due to that lot of paging happening on that server. vSphere DRS detects such things in quick time and moves few VM’s to another ESXi cluster to least-balance the cluster nodes without any downtime by leveraging vMotion functionality. It applies for high contention for CPU utilization too. So vSphere DRS helps to balance the CPU & Memory utilization across the ESXi cluster nodes. 18. What is vSphere storage DRS ? How it works ? vSphere Storage DRS like vSphere DRS but it applies to storage.It helps to balance storage utilization and performance between data-stores on same ESXi clusters. `19.What is VSAN ? How it works ? VSAN forms the storage pools across the multiple nodes using internal disks and allows you to create a datastores that spans multiple ESXI hosts. VSAN also protect the data using VM storage profiles and you can configure it according to your requirement. You need SSD’s(Solid State Drive) to configure VSAN. Click here to learn more about VSAN. 20.What is Flash Read Cache ? vSphere 5.5 supports solid state drive through feature called Flash Read Cache.Using Flash Read Cache, you can assign a caching space to VM’s like how are you assigning like CPU,Memory and other resources to VM’s. Solid state drive can provide much better that IOPS compare to normal disks. 21.What is the use of Storage I/O Control in vSphere 5.5 ? You can limit the number of IOPS for each VM. 22.What is the use of network I/O control ? Its similar to storage I/O control but its controls the VM’s Network bandwidth. It replicates the complete VM from one datacenter to another datacenter on per VM basis Unlike hardware replication. Hope I have mostly covered about all the vSphere products and it features in high level. Share it ! Comment it !! Be Sociable!!! Here we will see how to add the ISCSI storage to the Vmware ESXi 5.5 hosts using VSphere web-client.As you know ISCSI storage is very cheap and many companies are preferred to deploy ISCSI storage for low and mid range servers. ISCSI can’t match the performance with FC SAN but cost wise its very affordable. Many of vmware administrators is currently using VSphere Client but most of the web-client features will not be available on that and this indicates VMware is preferring web interface and they may stop developing client in near feature.So it’s time to move on to web interface. 1. Login to VCenter Server. Just open a browser and enter the VCenter server IP address or hostname. You will be navigating to the VSphere Web-client login page. 2.Navigate to the ESXi host where you want to add the ISCSI storage.After selecting the ESXi host, Just click on “Manage” tab and navigate it to “storage” tab.Click on the “+” icon add the ISCSI adapter. 3.After selecting the ISCSI adapter just click on OK to add it. You can see the new ISCSI adapter in the bottom of the adapter list. 5.Enter the ISCSI server IP address and iqn number and press OK. ISCSI protocol defaults uses port 3260. You should configure the VMkernel adapter in a order to access the ISCSI storage.This provides the dedicated virtual network interface for ISCSI traffic. 7.Select the VMkernel adapter for virtual SAN traffic aka ISCSI traffic. 8.Its up to you which virtual switch you want to use for ISCSI traffic. Let me go with vswitch0. 9. Enable the virtual SAN traffic for new VMkernel adapter. 9.Enter the New IP address for dedicated ISCSI traffic.This IP will be used for ESXi host to ISCSI server traffic. 11.Click finish to complete the wizard. 12.You can see the new adapter like the below one. 13.Again Navigate to the storage tab. Select the “Network Port Binding” and Click “+” to add new VMkernel adapter. 14.Select the newly configured VMkernel adapter and select OK to add it . 15.Now you have successfully configured the ISCSI target in ESXi 5.5 host. 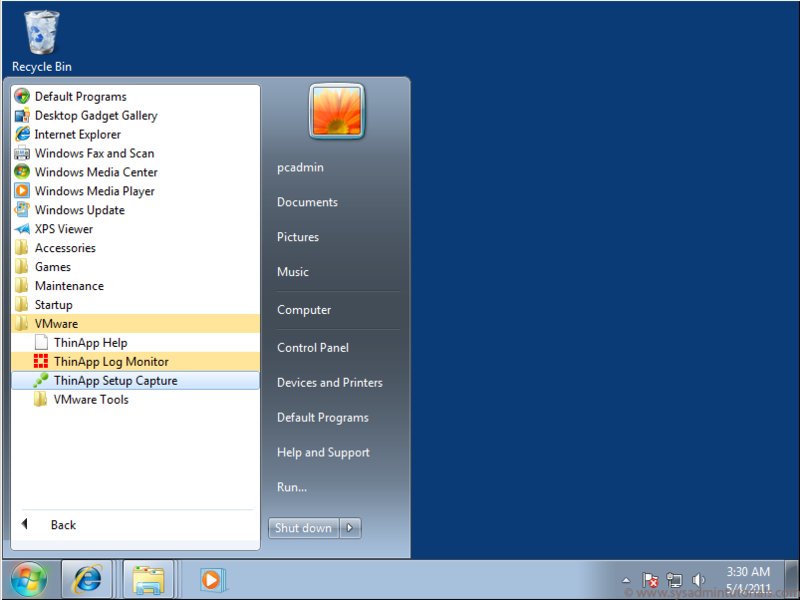 To see the provisioned LUN’s ,you need to re-scan the adapters.Click on the below highlighted icon to re-scan it. 16.You can see ISCSI storage LUNS on the device tab. Using these ISCSI LUN’s you can create a new datastore or can be added to the existing datastore for virtual guest use. Hope this article is informative you .